Primary Possibilities: Five For Friday with some Giveaways! Five For Friday with some Giveaways! 2. Have you all heard of "Scentos". Stephanie asked me to pick some up for her in at Michael's craft store because right now they are 49 cents there (usually a dollar). They are super cute and are all scented. Kids love to sniff their papers after you write a little note or put a smiley face on their paper. The little things that make kids happy in Primary :) True to teacher style, I totally cleaned that Michael's out. By the way... you can follow me on Instagram. That's actually starting to be a great way to find out about deals like this when bloggers share them as they find them! 3. 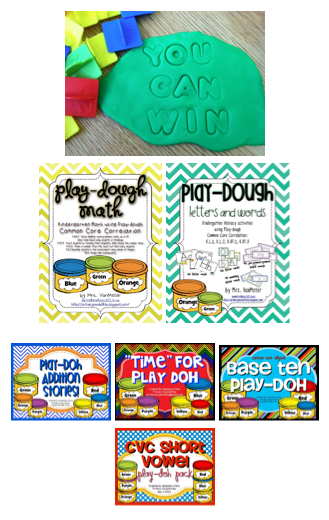 Don't forget to enter our Play-dough activity giveaway...It ends tonight! You can win all of our play-doh activities packs (6 in all!!). Super easy to enter! Click HERE! 4. Whose already working in their classroom for next year? I tell myself to stay away but I have already arranged my room, put up fabric for bulletin boards and bought my border for boards. Not to mention taking on a major classroom library overhaul. It's like a second home... I can't stay away! And it just keeps getting messier each time I go in evidenced in the photo below! By the way have you ever looked at a bulletin board at the end of the year and thought..."Why did i think that looked good?' That red bulletin board is U-G-L-Y and it came down super fast! Head on over to Doodle Bugs Teaching to link up with "Five for Friday!" Thank you!! It will all be switched over to bloglovin in July. Your play-doh activity looks like fun!! Do you get to work in your classroom all summer? We don't get to go back in until August 1 due to the janitors cleaning and waxing. I'm kinda jealous because I can't even get into my classroom over the summer...it's good and bad. Your room looks great!!! Your blog design is the cutest ever!!! Haha! I giggled when I saw the 6 year old cutting out materials. I have with held dinner from my entire family until they helped to cut things out! Of course I'm following. I need to get a work crew for cutting stuff out--the pups don't have thumbs. I had to go buy those pens after seeing them here, they are fun! I am jealous you can get in your room, that would be nice! My new school is still being finished so fingers crossed we can get in soon.